The sight of sick and tired stowaways found among washing machines in lorries at the Essex port of Harwich was pitiful, local MP Bernard Jenkin says. The Conservative MP visited the scene where the Border Force discovered 68 people, including 15 children and two pregnant women, on Thursday night. He told the BBC they had clearly been in the trucks for a long time, and many were dehydrated and very tired. He suggested ministers were taking the wrong approach to people trafficking. 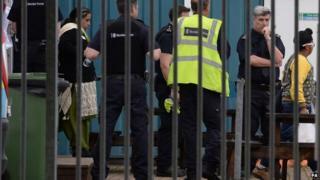 Four Polish lorry drivers were arrested on suspicion of facilitating illegal immigration and are being questioned at separate police stations. The Border Force found the suspected illegal immigrants inside four separate lorries at Harwich International Port. There were 35 people from Afghanistan, 22 from China, 10 from Vietnam and one from Russia. How many "clandestine" migrants come to the UK? Mr Jenkin said the individuals were being questioned on Friday night about who they had paid, how much they had paid and where they had got on the lorries - but none spoke English making communication difficult. The Red Cross, social services and ambulance services were all at the scene, while some of the most sick were treated at Colchester Hospital. It is believed those not seeking asylum will be sent back to their home country. Stena Line, operator of the Stena Hollandica ferry that transported the lorries, said the service had left the Hook of Holland on Thursday afternoon and had arrived at the Essex port at 19:45 BST that same day. It is not clear where the lorries had been before sailing to Harwich. Mr Jenkin said the operation had been intelligence-led, and "this is why we're allowed to feel delighted and proud of our border force" who had worked closely with the Dutch. The UK has an agreement known as "juxtaposed controls" meaning people travelling on certain routes between the UK, France and Belgium go through immigration checks before boarding a train or ferry rather than on arrival. No such agreement exists with the Dutch. Some 41,000 illegal immigrants were picked up at UK borders in the year to April, and almost all were stopped in France and Belgium before reaching the UK. Asked if it was time for an agreement with the Dutch, Mr Jenkin said he was advised that the UK had a "very good arrangement" with the Dutch. However, he said that only about 6% of lorries - or 250,000 - were stopped each year at Harwich port, and there was an argument for many more to be stopped and searched. Former chief inspector of borders John Vine, however, warned that any more checks could lead to clogged-up ports. He told the BBC that good intelligence and experienced staff were critical, but a lot of experienced staff were leaving and not being replaced. This week, the chancellor announced the Home Office, which is responsible for the Border Force, was facing budget cuts of £30m. Mr Jenkin, a former shadow defence secretary, said it was "bizarre" that one of the "frontlines" was not protected in the government's spending review, "and yet we're, dare I say, increasing our contributions to the European Union to spend on what they want". "I don't think the government's got the priorities right here," he added. The tragic deaths, 15 years ago this month, of 58 Chinese people in a lorry which had been searched at Dover was the first, and clearest, indication of an emerging problem: people smuggling. Migrants seeking a better life pay criminals to help them reach their destination. But the routes, typically through northern Africa and southern Europe, or via Turkey and eastern Europe, are hazardous. In the year to April, almost 41,000 so-called "clandestine" migrants were detected - the vast majority picked up by British staff at joint border controls in northern France and Belgium. But there's anecdotal evidence that because security is so stringent there, migrants are finding other ways to enter the UK: nearly 1,500 were discovered at ports in Britain - including Harwich. However, we may never know how many have got in without the authorities finding out.